Xavier Cortada. 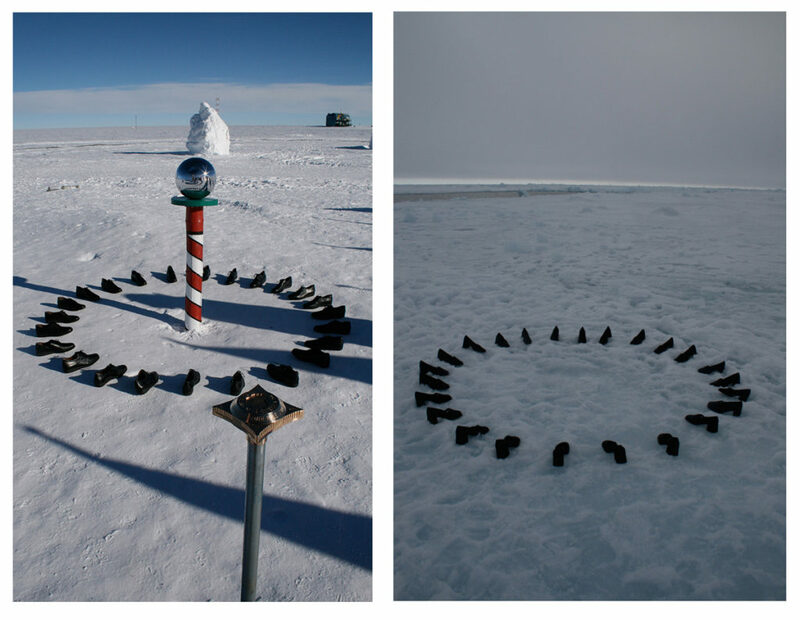 “Longitudinal Installation,” South Pole (2007) and North Pole (2008). 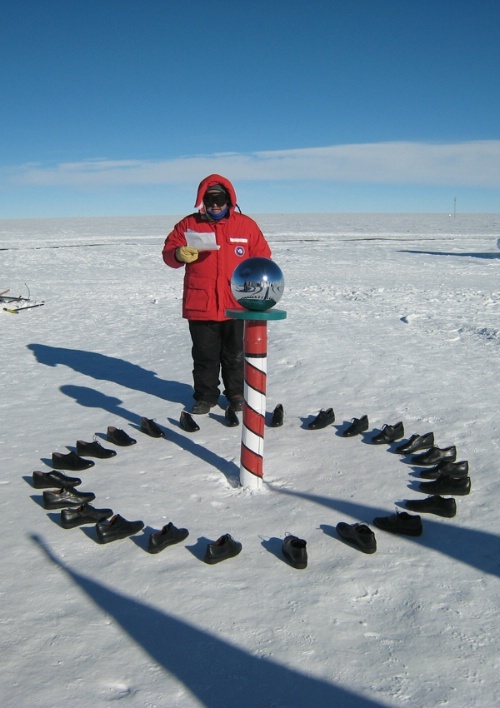 Cortada created the Longitudinal Installation in the South Pole in 2007 and in the North Pole in 2008. During both visits, Cortada placed 24 shoes in a circle, each aligned across 24 longitudes. He stopped in front of each of his longitudinal shoe markers and read a quote aloud that revealed a person’s experience with climate change from that part of the world. His artistic ritual illustrated how everyone in the world has been profoundly impacted by climate change. The South Pole’s Longitudinal Installation has been replicated as a ceramic sculpture on permanent exhibit at In the Garden at Pinecrest Gardens. This participatory art installation invites visitors to recite the 24 quotes, as Cortada did at both ends of the world. To perform the ritual, stand behind the show marked with zero degrees and face the red and white pole as you read the first quote. (You can find the quotes online at www.longitudinalinstallation.org.) Then, move clockwise, stopping at each marked shoe to read its respective quote. Upon completion, stand just to the right of the 75 degree West shoe (if you live in Florida) and recite a 25th quote: Your own quote! 25th Quote: How has climate change impacted your environment? The participatory art piece captures voices from 24 individual across the globe who have been impacted by Climate Change. Aside from his ongoing Florida is Nature project and the Longitudinal Installation, Pinecrest Gardens artist-in-residence Xavier Cortada is creating other permanent participatory art projects and ritualistic installations onsite at Pinecrest Gardens, South Florida’s Cultural Arts Park. To schedule an environmental art-based field trip for your classroom or co-op, please contact Lacey Bray, educational programs coordinator, at lbray@pinecrest-fl.gov. Pinecrest Gardens is located at 11000 SW 57th Avenue, Pinecrest, FL.